Three new chicks to add to our flock! This hen almost got her neck pulled the other night as I'm fairly sure she killed the first two chicks that hatched and then I had to dispatch a third that had a bad leg, luckily three more have hatched and seem healthy so the hen lives on, I won;t let her hatch eggs again though. 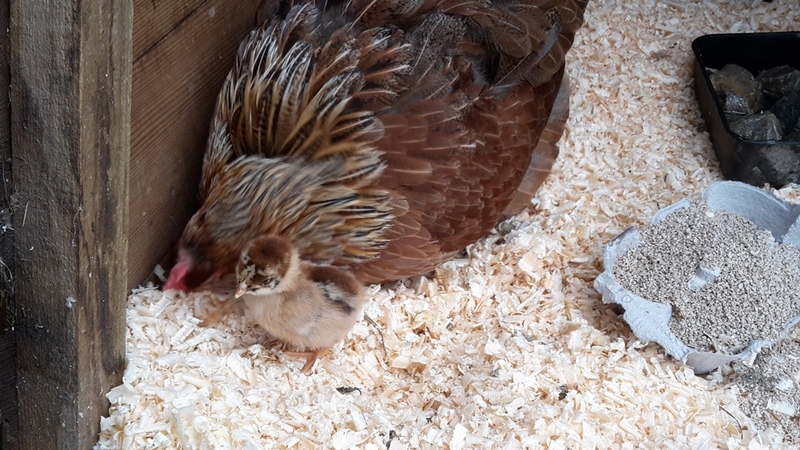 I certainly don't hatch enough chicks to be self sufficient in chickens but it is a great thing to do for the children, they love going to see them and watching them. 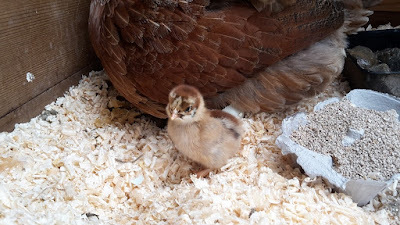 Maybe when I have more time I'll start hatching and breeding chickens a bit more, it's something I'd like to do and I think it could be a good paying hobby, but at the moment I've got far too much going on. Who else has been hatching eggs this year? My boss gave me some eggs, as I had a broody hen. I told him I thought his roster failed, none hatched. Nothing worse than a cockerel firing blanks! 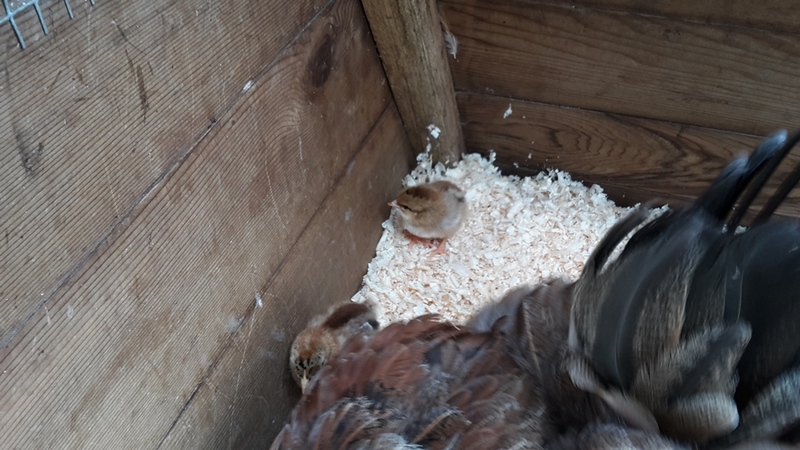 Your new climate will certainly encourage some broody hens! Looking forward to seeing what you get up to. This was a lazy accident really, from not collecting the eggs! Id love to have chickens in the future. I suppose like in all walks of life you get females who don't take to motherhood. This one is a lot better now she's calmed down. I don't think she'll be allowed to sit again though. My Muscovy duck sat on eggs, 3 hatched but only one survived. Not sure what happened to the other two- one looked like it barely survived leaving its shell, one died after 24 hours and the last one is doing well. Well I guess at least you have one that survived! It's a pain though as you still have to buy the chick crumbs even if it's just for one. Firstly, Kev, you are one of the winners of the eBook portion of my giveaway! Please visit my blog for what to do next, and then contact me at 5acresandadream at mail dot com with your choice. It is always fun to have a hen hatch chicks, but it's a little frightening to think she might have killed some of them. We've had both ducklings and chicks hatch this summer, and it's been an adventure both ways. I'll have to get a post up about the newest hatchling, a single chick that looked like he might have no mama. That's great Leigh! I'll send you an email straight away! I have my third broody hen currently which is unusual because I never had any at all until this year. I hope she does well. The first hen I put duck eggs under and the second hen (I did not know what was going on until it was too late) had her babies eaten my the turkeys. Which I immediately butchered. This third hen is sitting on some of our eggs and some I bought in. My rooster is a beautiful gentleman and basically a pet, but I don't think he's "getting the job done" so to speak. Congratulations on the new babies!